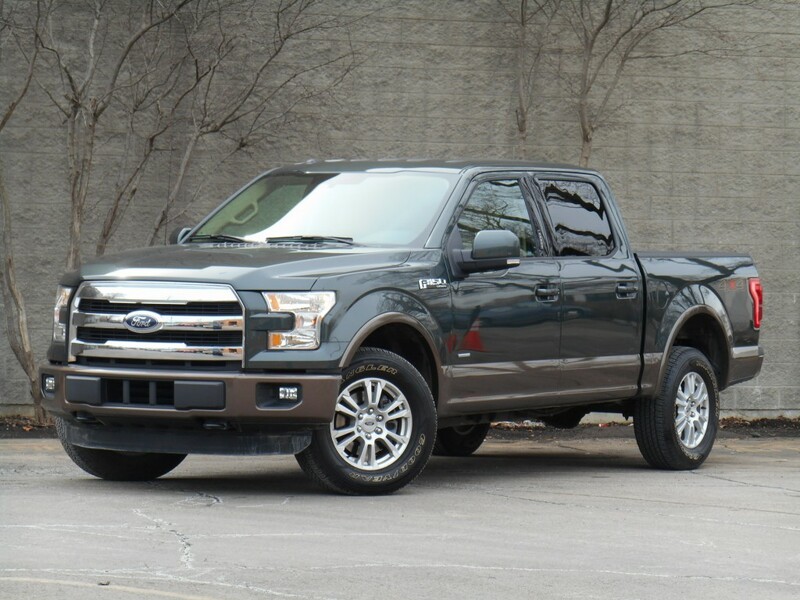 Although it’s not the first vehicle to have an aluminum body (Audi, Jaguar, and Land Rover have been building them for years), the redesigned 2015 Ford F-150 is the first pickup to have one. Companies that use magnetic sheets to advertise their businesses on their trucks are going to have to find a different way to adhere them, as they won’t stick to aluminum. Can’t say the folks at Ford aren’t bold. For the past 38 years, Ford could claim to have the best-selling pickup in the land, and the best-selling vehicle for 33 of them. So on those rare occasions when the F-150 has been redesigned, those involved were taking a big risk. None, however, have been bigger than this one. For the redesigned 2015 model, Ford has replaced the traditional steel body with one made from aluminum … yep, same as your pop can. Lighter weight resulting in better fuel economy was the goal, but there were a lot of risks involved—in manufacturing, in reputation, and in buyer acceptance. For instance, if you join—or even touch—an aluminum piece with a steel one, you start a corrosive process. So not only do the aluminum and steel parts of the truck need to be separated by some inert material, but even the tools used for bodywork have to be kept separate. Furthermore, two of the four engines offered on the venerable F-150 are now turbocharged—and rather small turbocharged ones at that. The top power option is a “traditional” 5.0-liter V8 rated at 385 horsepower. Then comes a 3.5-liter EcoBoost turbocharged V6 rated at 365 hp (an engine that has been available since 2011). 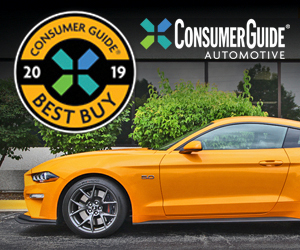 Moving down the ladder (power wise) is another EcoBoost turbo, a 2.7-liter V6 with 325 hp—which is new for 2015—followed by the base engine, a 3.5-liter V6 with 282 horsepower. While the body may have been light, the price tag on our mid-level Lariat Crew Cab 4×4 wasn’t; it topped $50,000 with options and destination. As usual, the F-150 is available in regular- extended- and crew-cab body styles with rear-wheel drive or 4WD in a variety of trim levels. What we tested was a crew-cab 4×4—the heaviest of the bunch—in mid-level Lariat trim with the new 2.7-liter EcoBoost V6. While we were skeptical about having such a small mill powering such a big pickup, the 2.7 proved to be “The Little Engine That Could,” moving this massive vehicle with surprising spirit. As typical of small, turbocharged engines, mashing the throttle from a stop resulted in “moving away” rather than “jumping” off the line, but power came in within about 15 feet to provide impressively strong acceleration—at least with little in the way of a load. Equally satisfying was highway passing power, aided by a transmission that kicked down fairly quickly when the throttle was stabbed at speed. Of course, the whole idea behind the lightweight body and small engine was to improve fuel economy, and indeed, the EPA estimates are top of the class. However, I averaged a mediocre 16.6 mpg over 330 miles of about 70 percent highway driving, though one all-highway stint returned 18.26 mpg—still well below the EPA estimate. While the ride was better than one might expect, there were still some telltale reverberations after larger bumps—typical of pickups—though they were nowhere near as noticeable as what might be considered “the norm” … though I think the Ram 1500 may still have an edge when it comes to ride quality. 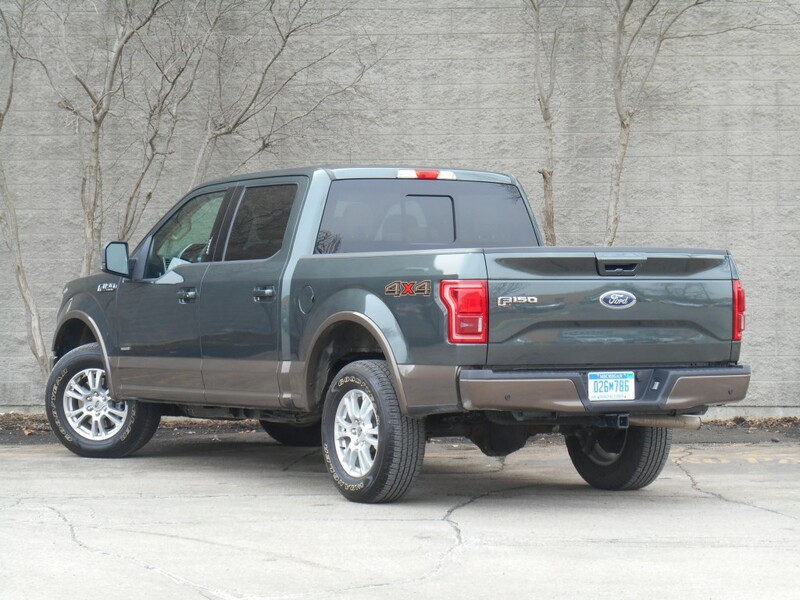 The F-150 also exhibited low wind and road noise at highway speeds, which—combined with the relatively smooth ride—made it a comfortable cruiser. 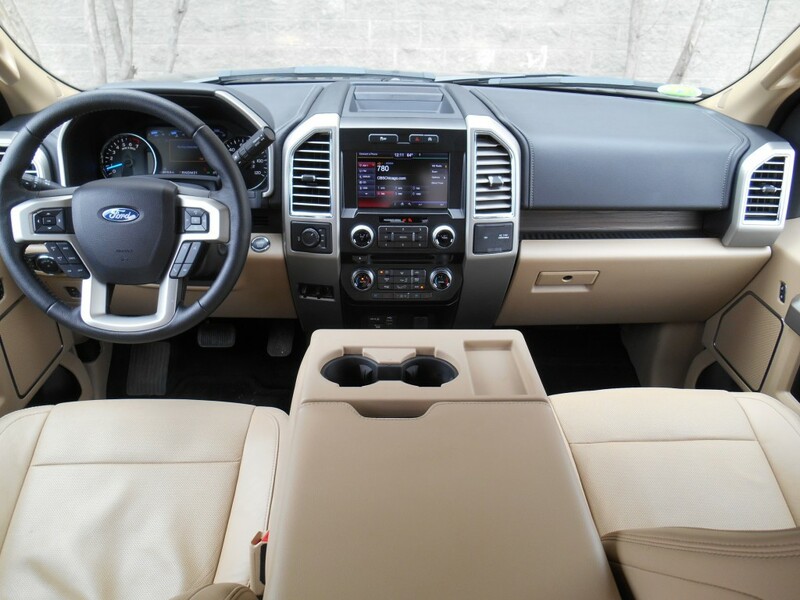 A two-tone color scheme in combination with woodgrain and matte-silver trim gave the interior of our mid-level Lariat an upscale look. As with most full redesigns, the inside was also updated. Fitted with a mix of woodgrain and matte-silver trim along with numerous padded surfaces, the two-tone interior projected a decidedly rich look and feel. There was also a good amount of storage, with a decent-size glovebox, a dashtop bin, a modest-size flip-up console box (our tester was fitted with a front-center seat for 6-passenger capacity, with the underside of the console box forming the backrest, which may have reduced space), a tray under the flip-up middle-seat cushion, four cupholders, a low center dash bin below Aux/SD card/2 USB/12-volt plugs (another 12-volt along with a 120-volt household plug are left of the glovebox), and small bins in the door panels with huge map pockets below. In back, the rear seat cushion flips up to provide a wide, floor-to-ceiling load space. Visibility is a mixed bag. It’s fine to the front and rear corners, but the side roof pillars are very thick, restricting the over-the-shoulder view to both sides—and the outside mirrors aren’t wide enough to compensate. Due to the wide dashboard, most controls end up out of easy reach. However, the numerous physical buttons and knobs are simpler to use than most “virtual” buttons layered on a touchscreen. The control layout could also be better. 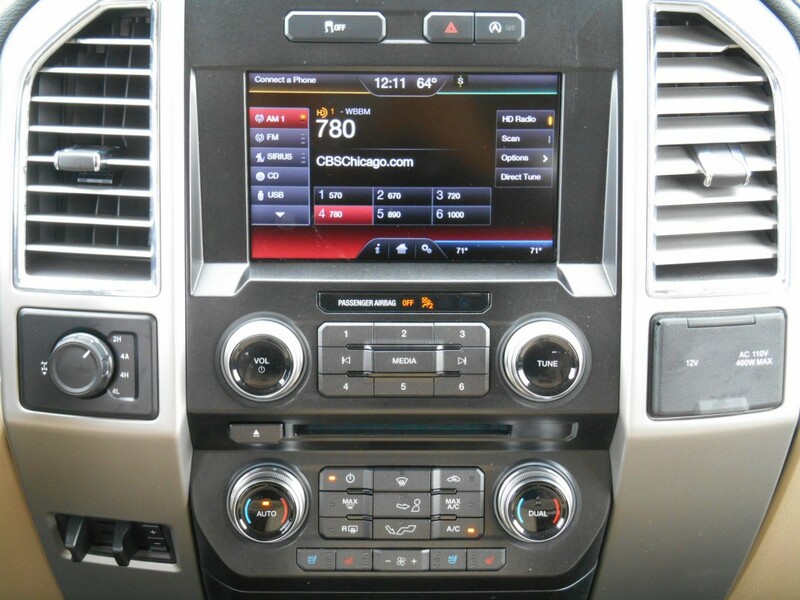 The touchscreen along with most of the surprisingly numerous buttons and knobs are quite a stretch away from the driver—with some mounted very low on the dash—leaving them out of easy reach. Yet most are otherwise simple enough to use, with only fan speed being controlled by inconvenient repetitive-step pushbuttons. You’d think a full-size crew-cab pickup would offer tremendous passenger space—and overall, the F-150 does—so it was surprising to find that the front seat didn’t go far enough back to afford stretch-out legroom to very lanky drivers (though most would find it ample). And though the doors are large, the step-up is exceptionally high; in fact, the floor in back sits a good three inches above the already-tall doorsill. Also high are the sidewalls of the cargo bed, which, combined with the tall ride height, means an average-size person can’t reach over the side to pick up items on the floor of the bed. One thing appreciated, however, was the counterbalanced tailgate, which dropped slowly when released. While the redesigned F-150 isn’t perfect, it is indeed a step forward, and we have no complaints with the “new” stuff—the aluminum body and the 2.7-liter EcoBoost engine. Unless folks get squeamish about those untested elements, we see no reason the F-150 won’t continue its three-decade winning streak. Written by: The Daily Drive staff on March 27, 2015.on February 22, 2018.